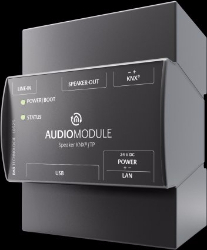 The AUDIOMODULE is a premium multi-room audio player with Digital Sound Processor (DSP profile selectable) which is alternatively available with a line-out (LINE variant) or integrated efficient Class-D amplifier (SPEAKER variant). As a top hat rail device, installed in the distribution board, it is protected against theft and manipulations. This makes it ideally suited for commercial properties such as hotels. Thanks to the direct KNX connection the AUDIOMODULE can be easily integrated into KNX® installations and allows on-site control with KNX® sensors as well as control through building visualisations. It can play audio from local media servers as well as stream internet radio stations and Spotify contents. The analogue audio input allows playback from external devices such as cd players. The external source can be selected manually or automatically with configurable settings. Configuring the AUDIOMODULE is particularily easy, using a built-in web interface. Based on the proven Squeezebox™ technology in conjunction with the Logitech™ Media Server it is integrated with the EIBPORT in no time in the KNX®- or EnOcean® installations. AUDIOSERVER and AUDIOAMP, sold separately, complement the AUDIOMODULE and help you realize a fully integrated whole-building audio solution.